As travelers we prepare for each new location or country by breaking out the maps and researching the history. The theme of “La Revolucion” is present in most of the Latin American nations where we have been, harkening back to the battles of the seventeenth and eighteenth centuries. But Nicaragua has its own unique perspective. 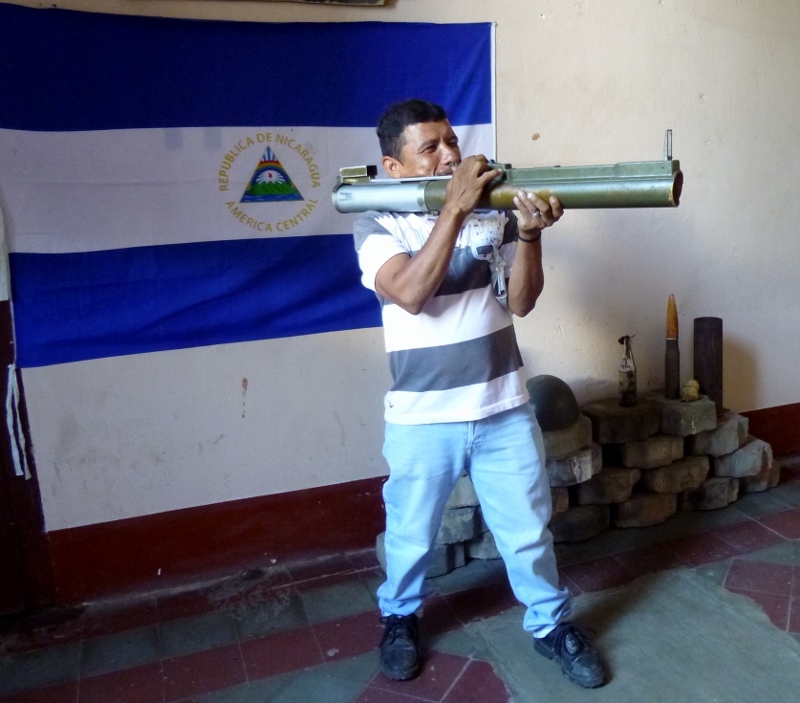 For, unlike Guatemala which fought a civil war for thirty-six years only to arrive at an armistice, Nicaragua experienced a real and successful revolution in 1979 with the overthrow of the Somoza regime by the Sandinistas. Leon, being the intellectual capital of the nation, has a special relationship with that historical period. It has always been the city favored by the more liberal of the country’s political class. The city figured heavily in the revolution, led by the FSLN (Frente Sandinista de Liberacion Nacional or the Sandinista National Liberation Front]. There was fierce street by street fighting as each side sought the upper hand. In a desperate move, the Somoza government resorted to bombing the city. 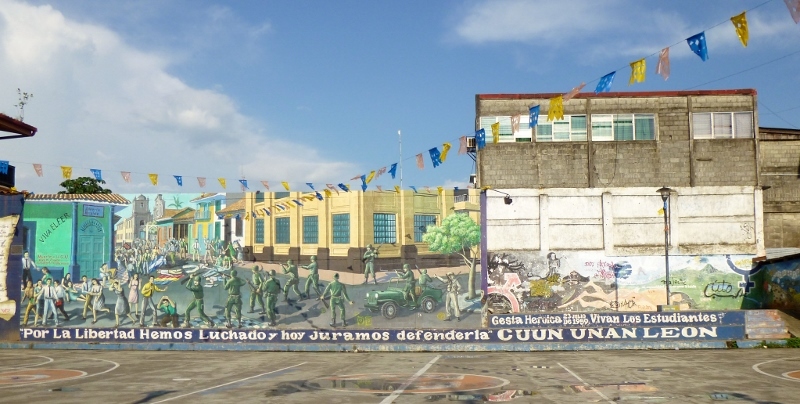 The Sandinistas eventually gained the advantage and held the city until the ultimate defeat of the Somoza regime. 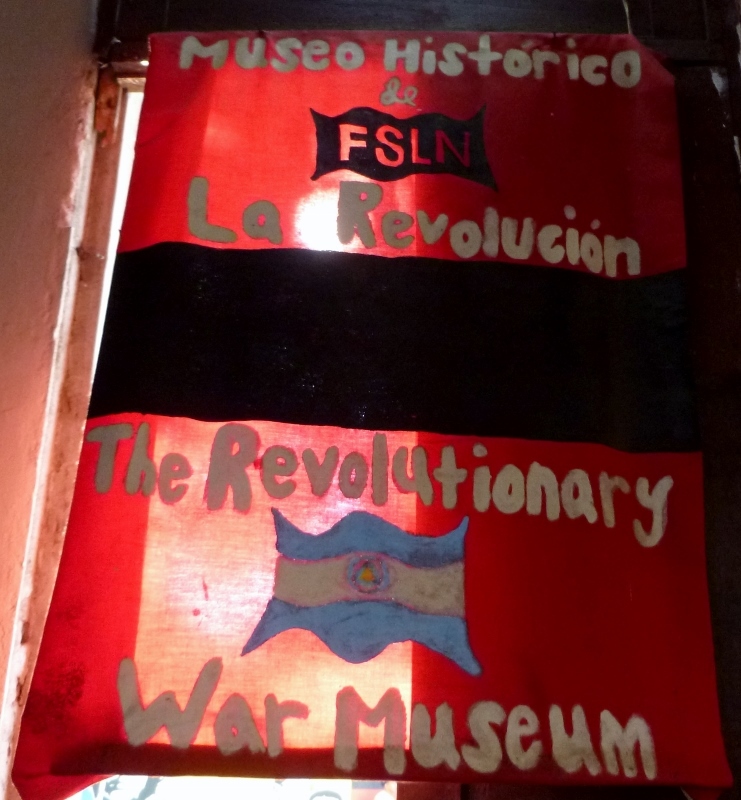 The Museo de la Revolucion, housed fittingly in the Palacio del Gubierno which belonged to the deposed Anastasia Somoza, is staffed by veterans of the conflict and contains a small collection of memorabilia. The residence still bears many the scars of the fighting including bullet pocked walls. Elsewhere in Leon is the old 21st Garrison, the prison used by the Somoza government at the time of the revolution, which depicts many of the brutal interrogation tactics of the discredited regime. Near the city center there are a number of street murals, some covering extensive portions of city blocks, honoring the martyrs of the revolution. 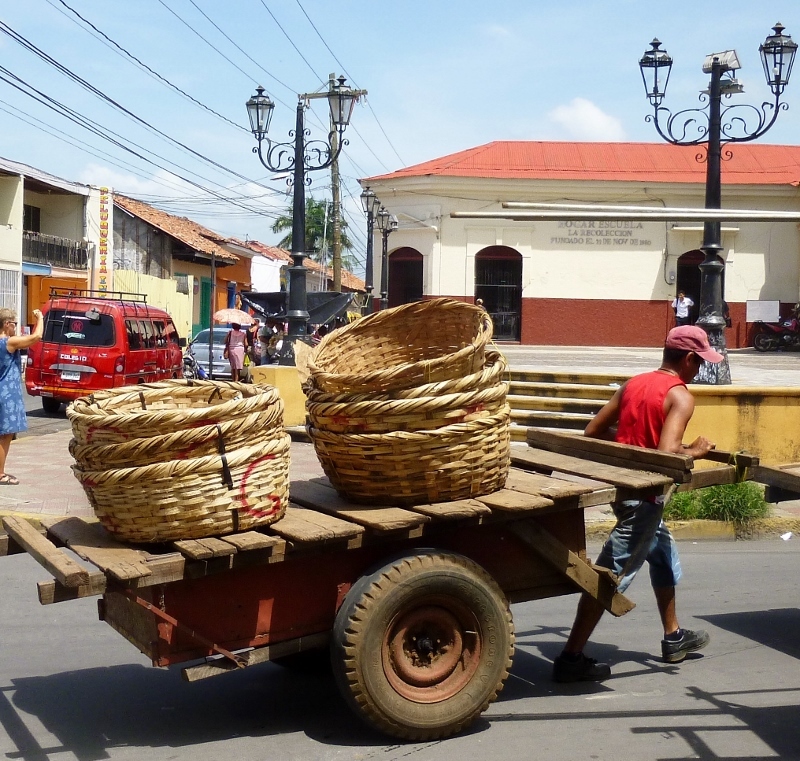 With Leon’s history – it was the capital city founded by Francisco Cordoba in 1524 and a major colonial center – and the recent revolutionary events, the city comes down on the proletarian side of the equation. 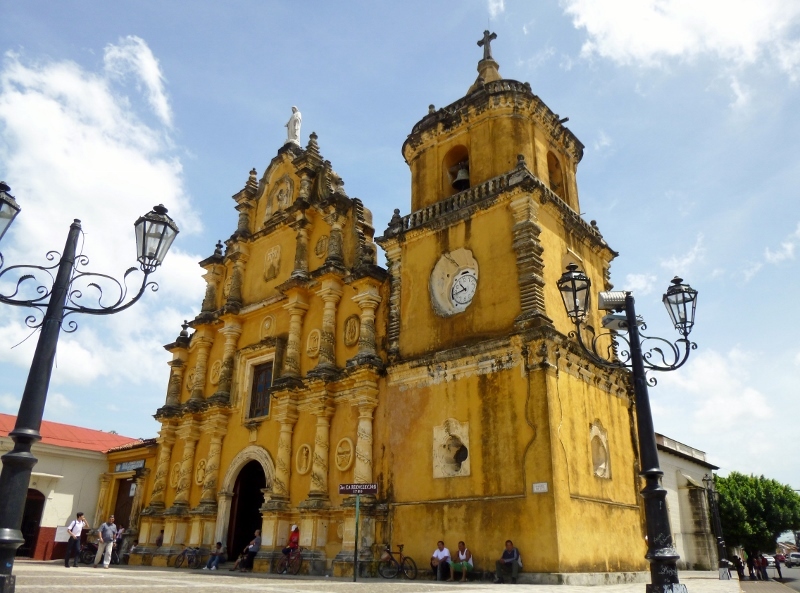 It is a nitty-gritty sort of place and does not display the grandeur of Managua or Granada. Over-laying the ancient churches and the colonial architecture there is a glimpse of the working class nature of the city. Pedi-cabs replace tuk-tuks for cheap personal transportation. 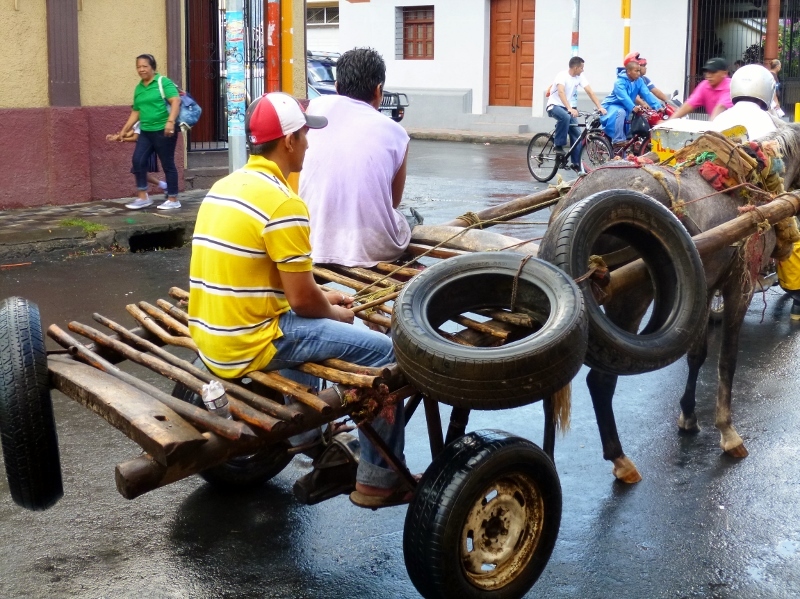 Horse drawn and human-powered wagons provide a means of moving goods within the city as well as from farm to market. Adding to the impression of the proletarian nature of the city is the number of shops given over to the sale of used clothing. This feeling was further underscored by the dearth of restaurants; even the “tipico” eateries which cater to the local population were not in abundance around the city center. It appeared that whether buying or selling, money was in short supply. Despite its relative humbleness, the good will of the people was obvious and abundant. It did not appear that hospitality was a casualty of the conflict.